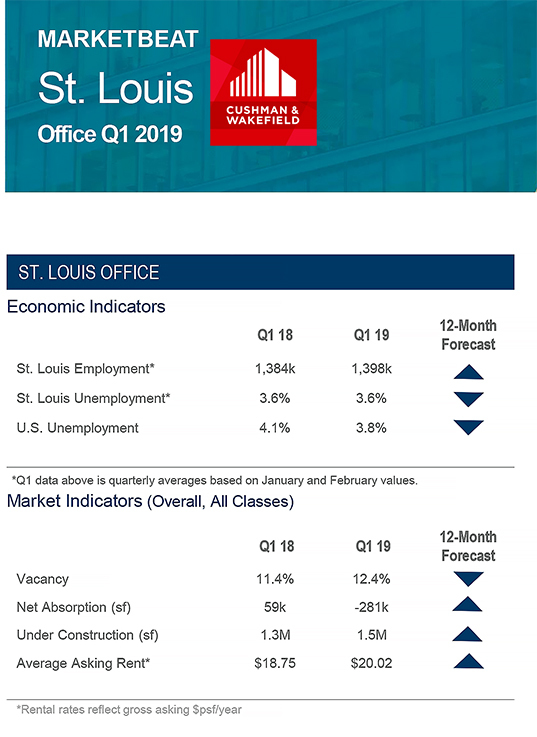 Despite some slight slippage in overall commercial office vacancy, absorption in the market for St. Louis office space remains tight, global real estate services firm Cushman & Wakefield observed in its Marketbeat St. Louis Office Q1 2019 report (click link to download the full report). 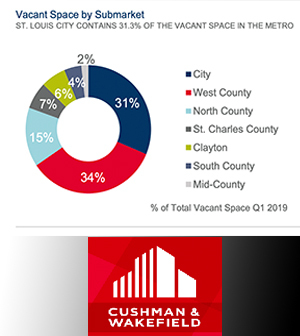 Downtown City of St. Louis continued to show promising growth in Q1 as the submarket was one of few across the metro to post positive absorption, with the Downtown submarket totaling 16,000 square feet of positive absorption and posting the lowest vacancy rate in absorption. At the same time, vacancy reached a cyclical low of 17.4%, marking the lowest vacancy in over 15 years. Armory, City Foundry, Ballpark Village and the Crescent Building delivering towards the end of 2019 and beginning of 2020,” the report stated. Clayton continued to remain the strongest Class A submarket. At just 3.4% vacancy with one available contiguous block of space larger than 30,000 sf, heightened demand for quality space has created a favorable environment for Clayton’s landlords. Year-over-year, Clayton class A rental rates have increased by $1.80 psf and growth is expected to remain strong as the area benefits from the delivery of Centene Plaza Building C at 7676 Forsyth Blvd. Centene Center is expected to command the highest rates across St. Louis, C&W said. Outside of Centene’s construction, there is no guarantee new space will be delivered any time soon, the report noted.